CrossFit Founder and CEO Greg Glassman said, “The greatest adaptation to CrossFit occurs between the ears.” It’s not new skills or PRs that necessarily make us able to do more work, but instead a new understanding of how we approach the workouts emotionally and psychologically. Tony Blauer says the same thing about violence. It’s not necessarily the skill or technique you use to defend yourself that saves you; it’s just the fact that you were mentally prepared to do something. Being lost is that moment when you emotionally, psychologically and physically freeze and fail to act. 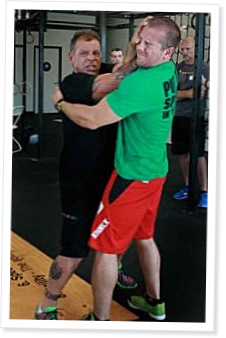 In a violent ambush, it won’t matter how elite your fitness is if you are unwilling or unable to respond. Blauer helps his students build a map to get there through fear management and by understanding the dynamics of a violent encounter. Great article!! CF gets you in the best shape of your life, and here's an opportunity to learn how to apply that fitness to protect yourself and your family. AWESOME!! If you have never been to a Blauer seminar I highly suggest you do so soon. Just learning the psychological aspect of a bad situation is worth the time invested.